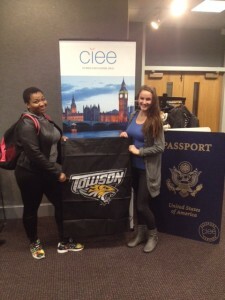 On February 1-2, Towson University Study Abroad partnered with the Council on International Educational Exchange (CIEE) to fund 67 free passports for TU students during CIEE’s Passport Caravan. In order to reserve a free passport, students needed to pre-register for the event. All TU students were invited to register. On the day of the event, students met with passport officers, filled out the paperwork and were able to complete the application process, all without spending a dime. In Maryland, regular processing fees for passports cost $135. The event was part of Towson Abroad’s commitment to Generation Study Abroad, an initiative to make study abroad possible for more U.S. students by breaking down the three major barriers: cost, curriculum and culture. TU’s goal is to increase the number of Tigers who study abroad by 40 percent by 2020.